HOST PLANTS: Any trees or shrubs, which are lacking in vigour, particularly those which are already beginning to die back can be affected by algae, lichen or mosses. In these circumstances the growth of lichen in particular is often unjustly blamed for the poor condition of an affected plant. Any trees or shrubs which have been neglected; especially where the branches have become overcrowded. The side of tree trunks facing the prevailing wind and rain may be colonised by moisture-loving mosses and lichens. Areas of trees and shrubs that are most affected are the trunks and branches. Algae, lichens and moss often form green or grey, powdery or mossy, crusty growths on the stems, branches and trunks of trees and shrubs. While this can worry homeowners, these growths are harmless, although occasionally they may indicate a lack of vigour in the affected plant. Algae are more noticeable after wet weather. Mosses and lichens are present year round, but are more noticeable in winter. The main cause is humid, damp, still conditions and poor plant vigour. Algae, lichen and mosses are non-parasitic plant-like organisms that colonise bark, rock and other hard surfaces. Lichens and algae are often mistaken for a fungal disease but, fortunately, they do not harm plants on which they grow. They can give a mature look to a garden, preferring damp areas with minimal air movement. Growths of algae, lichens and moss may be more common on plants lacking vigour, so their presence could indicate that attention is needed. Algae, lichens and moss are found in damp places, as not only do they need moisture for growth but also for reproduction. 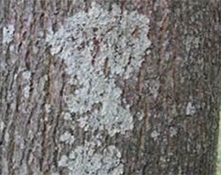 Lichens are particularly adaptable as they are able to exist where nutrients, and sometimes water, are scarce. However, they grow only very slowly so, unlike moss and algae, are slow to colonise. 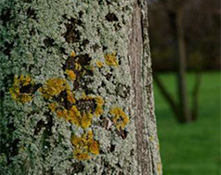 Lichens prefer areas with clean air, so are more common in rural districts. 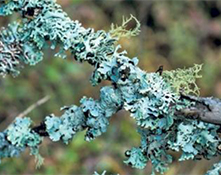 If algae, lichens and moss are considered unsightly, they can be controlled to some extent by improving air circulation; prune out overcrowded branches and cut back overhanging vegetation. Improve plant health care to try to stimulate new growth by fertilizing, mulching and watering. Once an affected plant regains vigour, badly affected shoots can be pruned out. Control is not necessary on tree trunks. There are no chemical controls for algae, lichens and moss on plants.